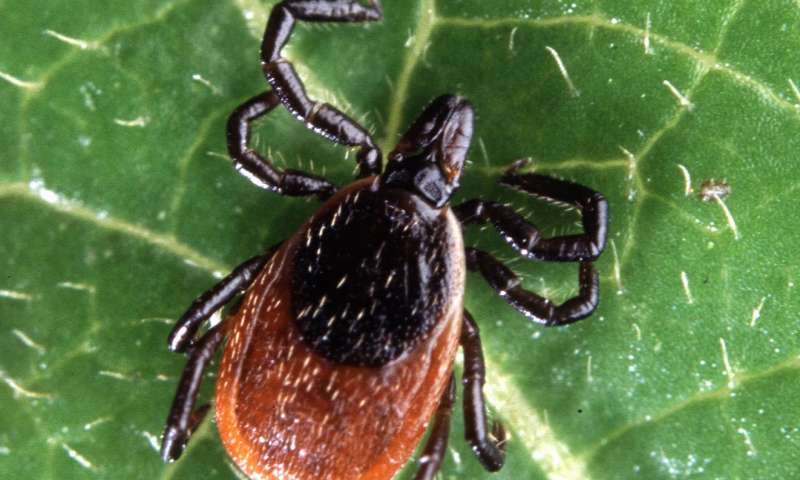 Tick-borne infections have reached epidemic proportions on Long Island, where children are disproportionately affected by Lyme disease and other infections transmitted by the eight-legged creatures, a panel of top scientists announced recently. "Lyme disease is mostly a disease of children and curiously mostly a disease of boys," Jorge Benach said at a recent symposium at Stony Brook University School of Medicine. Benach, who discovered the bacterium that causes Lyme disease, is a molecular geneticist at Stony Brook University School of Medicine. His observation that Lyme disease is mostly an infection of children was corroborated by Dr. Christy Beneri, a pediatrician at Stony Brook Children's Hospital. She said her institution encountered a wide range of tick-borne illnesses annually and that boys tended to outnumber girls in the number of infections. The most likely reason for the disparity, Beneri said, is the tendency among boys to play outdoors in wooded areas where ticks thrive. In the extensive pediatric research Beneri presented at the symposium was evidence of some children developing Bell's palsy, a temporary facial paralysis that occurs when the Lyme bacterium affects a cranial nerve. The paralysis resolves with antibiotic treatment, Beneri said. Beyond the Lyme bacterium, ticks on Long Island have been found to harbor babesia and anaplasma. Babesia are protozoa, or parasitic, infectious agents that hone in on red blood cells, similar to the way a malaria parasite invades the same cells. Anaplasmosis is an infection caused by the bacterium Anaplasma phagocytophilum. It can trigger aches, fever, chills and confusion. Beneri and Benach were among five leading Stony Brook experts, including university president Dr. Samuel Stanley, who addressed what they described as a mounting epidemic of infections caused by the ever-expanding range of ticks. Stanley, who was the first speaker, is a specialist in infectious diseases. "New York bears a disproportionate impact from tick-borne diseases," Stanley said at the symposium, which was held in a lecture hall in the university's health sciences building. "This is a regional and state problem." New York has the highest number of confirmed Lyme disease cases nationwide, according to the U.S. Centers for Disease Control and Prevention, which has cataloged more than 95,000 Lyme infections in the state since 1986. Suffolk County has long been ground zero for the ailment on Long Island, studies consistently have shown. "Cases in Suffolk County hover between 500 and 700 and this is just for the reported cases," Benach said, noting that Suffolk has among the highest rates of many tick-transmitted infections because of the dense infiltration of the insects in county. Typical Lyme symptoms include fever, headache, fatigue, and a characteristic skin rash called erythema migrans, said Dr. Luis Marcos, a specialist in internal medicine and infectious diseases. Marcos presented data showing the wide range of illnesses caused by ticks throughout the region, including Borrelia miyamotoi, a corkscrew-shaped bacterium identified in recent years as the cause of a relapsing fever. Dr. Eric Spitzer, a pathologist, discussed the many laboratory tests that Stony Brook used to arrive at a diagnosis of a tick-transmitted illness. He said that for years, doctors nationwide sent specimens to the university for analysis because of its well-known precision. Testing of those specimens earned the university $32 million over a 20-year period, he said. Panelists identified the most prevalent ticks on Long Island as the American dog tick; the invasive lone star tick, which migrated from Southern states; and the blacklegged tick, known as deer tick.